Often known as the “father of educational computing”, Dr. Seymour Papert’s interest in education was sparked by his early work with Dr. Jean Piaget. As a mathematician, Papert wanted to take the ideas of Piaget and apply them to mathematics education. Although Papert agreed with Piaget’s ideas of “constructivism” however, he disagreed with Piaget’s “stages of development”. In his book Mindstorms, Papert suggested that Piaget’s stages do not exist in children’s minds but in the poverty of school culture. Papert designed Logo, an educational programming language, as a richer learning culture. 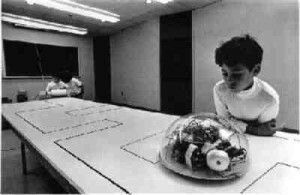 It was developed to have a “low floor”,-allowing children to engage with minimal prerequisite knowledge, and a “high ceiling”,-offering opportunities to explore more complex ideas (Papert, 1980). In Mindstorms, Papert stated, “The idea of “talking mathematics” to a computer can be generalized to a view of learning mathematics in “Mathland”; that is to say, in a context which is to learning mathematics what living in France is to learning French”. The famous Turtle programmed by Logo. Logo has helped people to think differently about how to teach geometry and social science through programming. A modern day version of the Logo Turtle as seen in Python. The video below shows children programming with Logo. Notice how students were able to apply their programming knowledge to solving math problems. What more can we say? Witness it yourself. Try coding in math class, along with your students. Papert, S. (1993) The children’s machine: Rethinking schools in the age of the computer. New York, NY: Basic Books. Papert, S. (2002) Hard Fun. Bangor Daily News, Bangor, Maine. 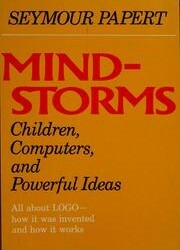 Papert, S. (1980) Mindstorms: Children, Computers, and Powerful Ideas. New York, NY: Basic Books. Papert and G. Caperton (1999) Vision for Education: The Caperton-Papert Platform. Proceedings of the 91st annual National Governor’s Association meeting, St. Louis, Missouri.